We herby give the following confirmation and evaluation on Mr. Terje Dahl's table tennis education and career in Norway. 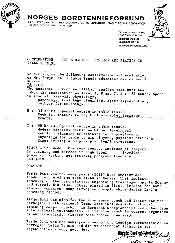 The enclosed "Trenersertifikat" confirm that Dahl has taken the examination on level A, B and C.
Sports in general; anatomy, physiology, psychology, training/ planning, sports organisation, methods for coaching. B: 35 hours. Special course in table tennis. Techniques, tactics, rules, trainers role, beginners, school. C: 50 hours. Special course in table tennis. Exam: Writing a 30 page planning/instruction. in training and matches in high level (Swedish players). Working out training programs from the analysis. Terje Dahl was for many years (10??) head trainer and leader in one of the best clubs in Norway. That includes coaching of the best players, organising training camps in Norway and abroad. His club, Fokus, played in the first division for both men and women, won many championships during Dahl's coaching period. Terje Dahl was also for the same years coach and leader for the Norwegian Youth National Team. That includes international training camps, coaching in European Championships and other Open international tournaments. He did also teach in courses organized by our association (leader-/ and trainer courses). Terje Dahl was for many years one of the leading personalities in Norwegian Table Tennis and did on different levels in our organisation a very good job. I have known Terje Dahl since 1976 when he was trainer and motive power in the table tennis club in Oslo called Focus. This club he brought up to the Norwegian elite. 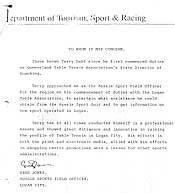 He also was the trainer for Tone Folkeson who was on her way to the European elite. Terje had worked hard in Norway, both in the Focus-club and to make table tennis a big sport in the whole country of Norway. Terje is educated to be a good trainer through the "course III" in Sweden. He also has led several training-camps for good Swedish and Norwegian players, also from my club. The sport of table tennis is grateful to have such a competent leader as Terje. 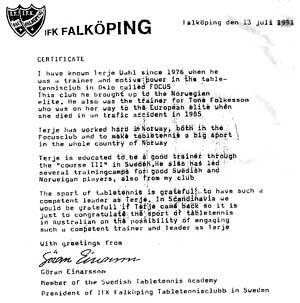 In Scandinavia we would be grateful if Terje came back so it is just to congratulate the sport of table tennis in Australia on the possibility of engaging such a competent trainer and leader as Terje. 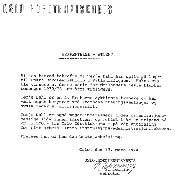 Falkoping 13th of Juli 1991. We hereby confirm that Terje Dahl has played on the team of Fokus Table Tennis Club in the Eastern Norway League. Fokus BTK were the winners of this series for the bests clubs in Eastern Norway the season l972/1973 as the year before. Terje Dahl is one Oslo's most skilled coaches and been used very often in our training sessions and arrangements of division games. Terje Dahl is also very interested in the organizational side in sports, and received this year a grant of kr. 2.500.- from Oslo Sports Association - on our recommendation - for his work in coaching/administrasjon . Oslo Table Tennis can give him the best recommendation. It is a pleasure to be able to certify that Terje Dahl was elected as Vice President for Fokus Table Tennis Club in April 1972. 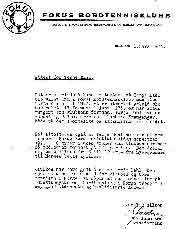 After excellent work he was elected as President in June 1973 and has since served as the club's President. Terje Dahl has a significant share of the credit for the club's successes, both on the sporting and administrative area. 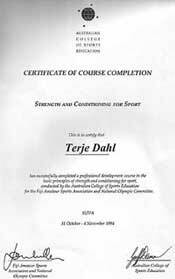 I can certify that Terje Dahl has worked as coach in Fokus Table Tennis Club since September 1972. He trains the club, which has 66 members divided into three groups, 16 hours a week; players from 8 to 50 years - from beginners to Norway's best players. The club has only good words to say about Terje Dahl; he does an excellent work for the club and Norwegian table tennis. We hope he can be admitted to the National Sports Academy; table tennis in Norway needs educated and qualified leaders. I have known Terry Dahl since he first commenced duties as Queensland Table Tennis Association's State Director of Coaching. 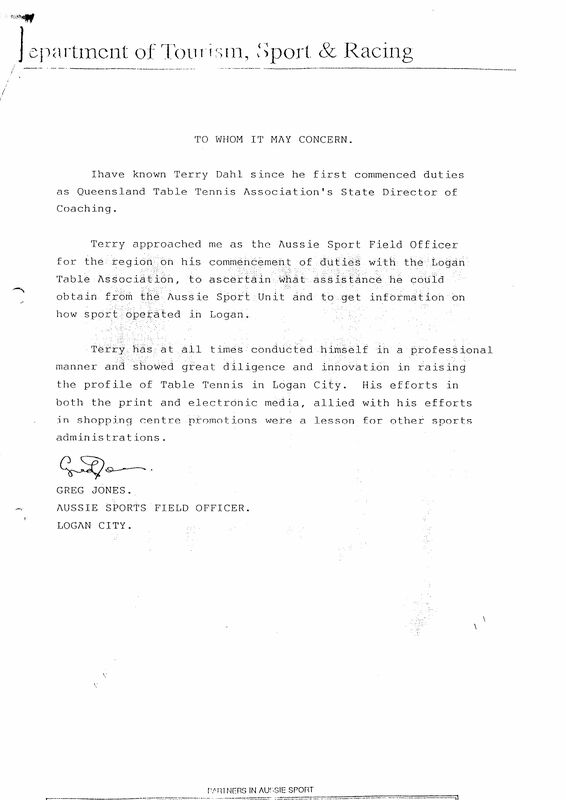 Terry approached me as the Aussie Sport Field Officer for the region on his commencement of duties with the Logan Table Association, to ascertain what assistance he could obtain from the Aussie Sport Unit and to get information on how sport operated in Logan. Terry has at all times conducted himself in a professional manner and showed great diligence and innovation in raising the profile of Table Tennis in Logan City. His efforts in both the print and electronic media, allied with his efforts in shopping centre promotions were a lesson for other sports administrations. 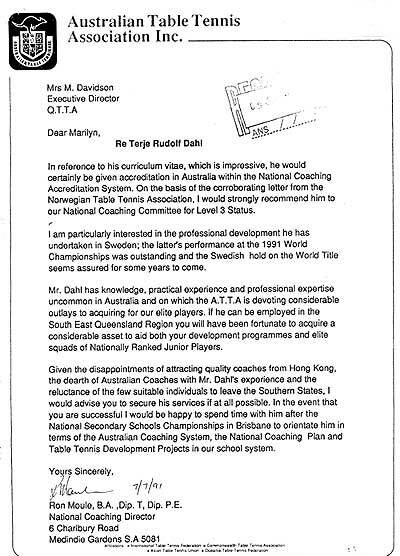 Australian Table Tennis Association Inc.
Re Terje Rudolf Dahl ' In reference to his curriculum vitae, which is impressive, he would certainly be given accreditation in Australia within the National Coaching Accreditation System. On the basis of the corroborating letter from the Norwegian Table Tennis Association, I would strongly recommend him to our National Coaching Committee for Level 3 Status. 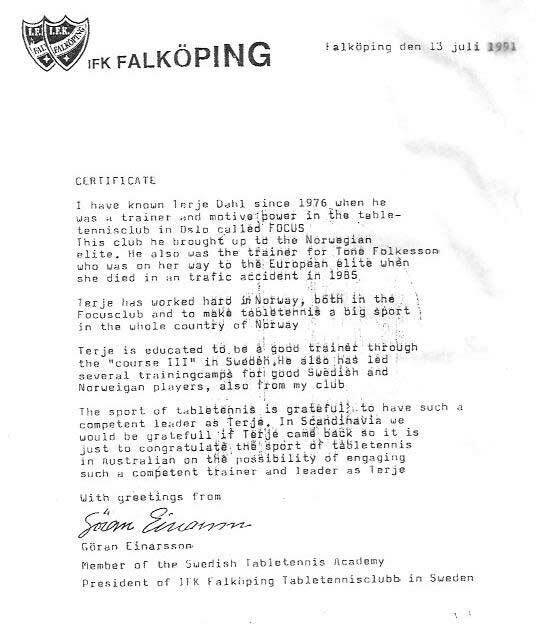 I am particularly interested in the professional development he has undertaken in Sweden; the latter's performance at the 1991 World Championships was outstanding and the Swedish hold on the World Title seems assured for some years to come. Mr. Dahl has knowledge, practical experience and professional expertise uncommon in Australia and on which the A.T.T.A is devoting considerable outlays to acquiring for our elite players. If he can be employed in the South East Queensland Region you will have been fortunate to acquire a considerable asset to aid both your development programmes and elite squads of Nationally Ranked Junior Players. Given the disappointments of attracting quality coaches from Hong Kong, the dearth of Australian Coaches with Mr. DahI's experience and the reluctance of the few suitable individuals to leave the Southern States, l would advise you to secure his services if at all possible. In the event that you are successful l would be happy to spend time with him after the National Secondary Schools Championships in Brisbane to orientate him in terms of the Australian Coaching System, the National Coaching Plan and Table Tennis Development Projects in our school system. Yours Sincerely, Ron Moule, B.A. ,Dip. T, Dip. P.E. 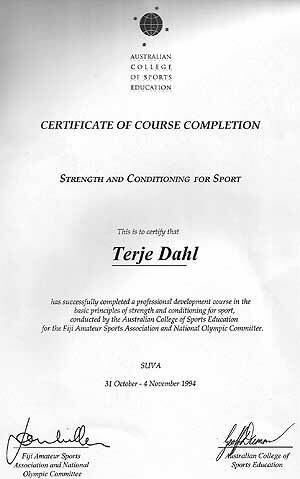 has successfully completed a professional development course in basic principles of strength and conditioning for sports conducted by the Australian College of Sports Education for the Fiji Amateur Sports Association and National Olympic Committee. I had a look at Terry's academy website and it makes no comparison with the Townsville club as regards the Academy being a serious club and Townsville TTA being only a hobby club. It does mention that one of the purposes of the Academy being formed is so that people in Townsville can appreciate that Table Tennis is a serious sport and not just a hobby. As far as I can recall this has been Terry's stated aim even back in the early 90's while coaching in Brisbane. His website specifically makes no mention of any other club's in this statement only a claim of what he purports the academy to be aiming for. I think that he has been unjustly maligned for this and also once again completely misunderstood by certain people who really don't understand his goals and intentions or who are using it as an excuse to hit out at him and as an excuse for some pretty doubtful exclusionary practices. I am extremely concerned as by the trends (e.g. of Mackay being fairly quiet and cancelling their tournament) and the North being pretty quite as well. It is looking at present like North Queensland is sliding off the Table Tennis map. Townsville TTA should be supporting the new club not trying it's best to scupper it before it gets going otherwise the sport is likely to die off up here. Group coaching has produced all the top players in Europe, so it should not be difficult to understand the value of group coaching. It might take some time to reach an acceptable level (learn the basics) but from there you have to play with many different players and learn from each other! Terje Dahl has recently been in Norway. 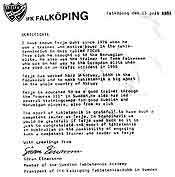 There he contacted the best club in Norway, Fokus. Terje is still having his old reputation, he has made a lot of players norwegian champions! So off course we let him into the training with the other national team coaches. We used Terje as a coach for young players and also players on the norwegian national team. It was great for us to see him with the players and we realized that he was still a good coach with all the great ideas, but also that he had been followed the tabletennis development, with a mix between group and multiball training. Especially the group training was very good with much variation in excersises and good contact with the players! I really hope there is a club in Australia who can take benefit on his great knowledge in Tabletennis. Jan Bergersen, coach Fokus Tabletennis club and norwegian national coach! First Norwegian tournaments with time tables, barriers, scoring boards and umpires. First cadet tournaments and league. First to take Norwegian players to Swedish summer camps. First to hold summer camps in cooperation in with Swedish associations. First to take a Norwegian player to visit the Swedish table tennis school. First table tennis hall Norway. First serious planning by a Norwegian table tennis association. First to implement physical training, goal-setting and season-planning for Norwegian players. First table tennis association in Norway to use a sport psychologist. First to hold national training squads for cadets and juniors in Norway. First to write table tennis articles on a regular basis for Norwegian newspapers. First to implement national table tennis training squads in Fiji. First televised tournament in Fiji. First cadet tournament in Australia. First info-kits for schools and media in Australia. 65 Norwegian championships as a coach. Winning the Norwegian league for teams; both men and women. First Norwegian medals at the Nordic Championships; Teams for men and teams for juniors women. Best result for a Norwegian cadet team ever at the European junior championships. Best players: Tone Folkeson, best Norwegian female player ever (Norwegian senior champion 14 years old), Pål Guttormsen, best Norwegian male player ever (he started playing in England and runner up in Cadet singles in the Euopean Championships for juniors) , Dag Vavik winning all major senior- and junior championships in Norway as 17-year old, except men singles in the Norwegian senior championships, good results as junior for the Norwegian national team. Fokus TTA won the trophy as best association in a Swedish tournament. Tone Folkeson beating the Swedish junior champion in a Swedish tournament. Logan TTA beating Brisbane 6-0 in the State League. First silver medals to Fiji at the South Pacific Games - after a few weeks coaching. Fokus TTA team of two U10 boys runner up for U11 teams in the unofficial Norwegian championships for mini-cadets (2008). The juniors that I coached eventually stepped up to senior level and had very good international results (beat England), until a taxi with the Norwegian players had a serious accident in Spain (one killed, one permanently paralysed, one quit playing). World Champions J-O Waldner and Jørgen Persson - at a Nordic summer camp for juniors. World Champion Peter Karlsson - summer camps in Falköping, Sweden. Li Chunli - a weekend clinic in New Zealand. I believe I also have coached Carl Prean, when with the Norwegian cadet and junior teams in England. I was fortunate to learn from, and work together with, the Swedish top coaches Thomas Stenberg (Swedish teams and summer camps), Allan Dahlgren (Stellan Bengtsson/Ulf Carlsson/Falkenberg) and Christer Johansson (Swedish team when world champions). In Australia they believe that a table tennis coach has to be a good player. Well, myself I could beat J-O Waldner's coach (Nisse Sandberg) - and I don't even consider myself a player! And you would never see Christer Johansson play (even if he could play)! "Responsible" might be the best world to characterize a good coach. committed to the sports and success the best coaches display a clear commitment to looking out for the best interest of the individual players. " I have never left table tennis as a coach or administrator due to lack of success - but more because of it (and lack of a professional attitude from the environment)! was wrong - I learned in Norway this year (2009) that I was 20 years ahead! Table tennis have seldom been my main work - it has mostly been voluntarily, even if I tend to spend more time on the sports than my job! I have been a teacher in schools (primary and secondary), managing director of a company importing sports-equipment (mainly table tennis), copy-director in some of Norway's leading advertising agencies, freelance journalist, author and web-editor. And also a yachtsman, fisherman and farmer: I left Norway to sail single-handed to the Pacific, and later I lived on an uninhabited coral-island for some years with my Polynesian wife Emma. We have two kids: Sonia and Olav. Besides from being a table tennis coach I also have also been coaching in soccer and tennis. I am also interested in music - and I was the first person to record and release a music-cassette in Tuvalu! I am also quite concerned of the climate-change - and have helped Norwegian environmental organisations, challenged the government and edit an internet newspaper. I have been on the tv (and radio, newspapers and magazines) many times - sports, adventure, travel, news, entertainment and environment.